In an unassuming street in Beeston, there is an exhibition space like no other. 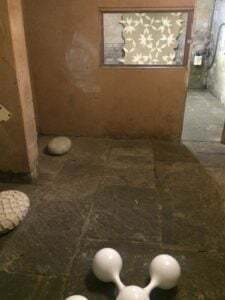 BasementArtsProject is a basement that has been transformed into an exhibition space, playing host to a range of national and international artists, with a rolling programme of events. Basement strives to assist in the development of artistic practice and allows space for experimentation. The curator, Bruce Davies, greets visitors on arrival, welcoming you in with a fresh pot of coffee and biscuits. 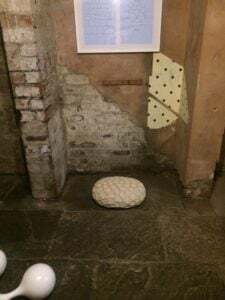 BasementArtsProject latest exhibition, A Study of Aperiodic Tiling with special reference to the 3rd Dimension, features work by artist Dominic Hopkinson. On entering the exhibition, you are first led to the living room of the family home, where there is a selection of Hopkinson’s framed pieces. Curator Bruce explains how Hopkinson plays with the interrelation of mathematics and science, and here you are confronted with a series of images depicting tiling comprised from two differently shaped rhombic tiles. The pieces look like they could be repeated to form an exact matching larger sheet, and the pattern has a single point of origin from which it expands, reminiscent of the big bang. Although minute, there would be differences if the pieces were repeated. Hopkinson highlights elements of a pattern in each of his series by using colour to fill in certain tiles. The colours totally transform the piece and it is fascinating to see the different shapes that emerge. Bruce thoroughly explains each piece; he has such a wealth of knowledge about the artist and his process, and his passion for the exhibition only serves to generate excitement at the prospect of what lies downstairs. As you walk down the basement stairs, the lights are dim, there is a faint, familiar smell of MDF, and you emerge into the hub of Basement Arts. The room is divided in two by a small partition wall with a serving hatch, enabling you to glimpse the pieces in the next room before you enter. The work on display is predominantly sculptural, although there are a couple of paper based items, and you can clearly see that these are the actualisations of the paper investigations upstairs. 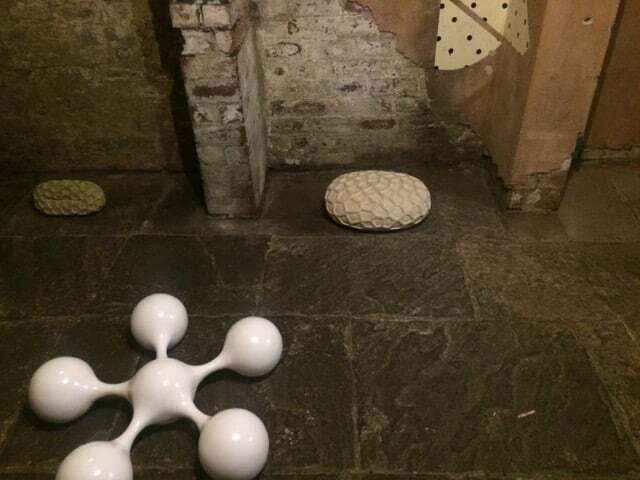 The pieces are all fairly neutral in colour but vastly different in form, with some shapes on the floor which almost look like blood cells. Apparently, these are ‘impossible’, and their production has been somewhat of a scientific and mathematic breakthrough. There are also wall mounted pieces which are literal reproductions of the tiles; one of these runs the length of a wall, spilling onto the floor, and is unbelievably striking. A few of the rhombic tiles are constructed from a lighter wood and it is this that produces an irregular pattern on the piece. If you look carefully around the space you can see the imprints of the previous shows that Basement has hosted. The place has a history that is brought into the present, each artist has the option to remove the traces of the shows, but as of yet this hasn’t happened. 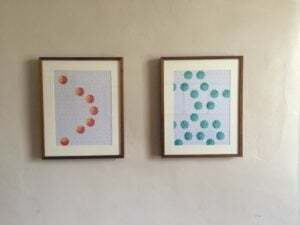 Nothing in this exhibition is accidental, it all has such a firm footing in mathematics and science, and even if you didn’t realise this, the pieces on display are so aesthetically pleasing in their own right, Dominic Hopkinson’s work is a must see. There are a small team of people who make BasementArtsProject what it is with Bruce at the forefront. He is a great representative of the artists and provides you with an incredible experience. Although the space is a little out of the city centre, it’s well worth the effort to get there. The next exhibition opens on the 6th May, and is called A Feast of Beeston – a project by Ian Pepper. A Feast of Beeston aims to create an honest portrait of a community that lives on the geographical fringe of the city as well as at the fringe of mainstream culture; a society that is both proud and protective of heritage and identity. Images credited to Timid Elk.